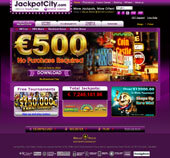 Jackpot City Casino opened its virtual doors in 1998, and is owned and operated by Digimedia Ltd. The online casino is licensed and regulated by the Lotteries and Gaming Authority of Malta. Jackpot City is available both as a regular online casino and as a mobile casino. The online casino undergoes annual external audits and holds the eCOGRA Safe & Fair seal of approval. The casino offers a $1600 welcome bonus and supports a number of languages and currencies. There is a loyalty points program available for players, and many banking choices and 24/7 customer services available. Security: Jackpot City Casino uses 128-bit SSL data encryption technology to ensure that date that is transferred over the Internet is kept safe and secure. $/£/€ 1600 Free on Your First 4 Deposit! New players at Jackpot City online casino are given a bonus of up to $/£/€1600 (4×400). – And if your Fourth single deposit is $/£/€600, the Casino will give you a Sign- Up Bonus of $/£/€400. Players earn a different number of loyalty points depending on which game they are playing. Each 10 casino credits that are deposited and wagered gives players between 1 and 3 points. Every 200 points accumulated is equal to one credit. Loyalty points can be redeemed once a minimum of 200 points have been collected. Players can decide when to redeem their loyalty points. Jackpot City Casino is powered by Microgaming’s software, and undergoes annual external audits. The online casino holds the coveted eCOGRA Safe & Fair seal, and offers players the option to use the casino in many different languages. Languages that are supported at Jackpot City Casino include English, Spanish, Dutch, German, Polish, French, Italian, Portuguese, Japanese, Russian and other languages. The casino offers both a download and a no download option. The download option has more than 400 casino games available and the no download option has about 200 casino games available for instant play. Jackpot City Casino offers a variety of online slots, blackjack, video poker, roulette, craps, baccarat, keno, scratch cards, bingo and slots and blackjack tournaments, along with an array of progressive jackpot games linked to the Microgaming network. The currencies accepted at the online casino include AU, CA, and US Dollars, Swedish Krona, Swiss Franks, Pounds, and Euros. Credit Cards (Visa, Master Card, JCB, Diner’s Club), Debit card (Visa Debit, Visa Electron, Maestro, Solo), EcoCard, EntroPay, U|NET, BankLink Swedbank, Citadel Direct, Direct Bank Transfer, Fast Bank Transfer, Lobanet, Neosurf, WebMoney, PaySafeCard, Click2Pay, ClickAndBuy, Ukash, eCheck, EziPay, InstaDebit, MoneyBookers, Neteller, PostePay, UseMyBank. Cheque, Credit Cards (Visa), Debit card (Visa Debit, Visa Electron, Maestro, Solo), Direct Bank Transfer, Click2Pay, ClickandBuy, eCheck, ECO Card, EntroPay, Ezipay, InstaDebit, MoneyBookers, NETeller. The Jackpot City Casino offers players live support via the Live Chat button that is found on the site for those who want immediate assistance. The customer support is offered 24/7, however, for those who are using local telephone numbers to contact the support center, support in some countries, such as Spain and Italy have limited operating hours. The international support desk can be contacted 24/7 from any country.